Cebu Pacific's new direct flights from Manila to Caticlan and Cebu to Caticlan is now live. From Caticlan, the world famous beaches of Boracay is just a short boat ride away. Last December, Tutubi availed of the famous Piso Fare of Cebu Pacific to get low cost, short travel time to Boracay Island. He came to explore Boracay Island's hidden wonders the usual visitors of the Philippines' most famous tourist destination don't get to see. The spanking new ATR 72-500 aircraft still smelled like it has just been taken out of the factory. Arranged with 19 rows and 4 columns, passengers were made to occupy front, middle and back rows to stabilize the aircraft. 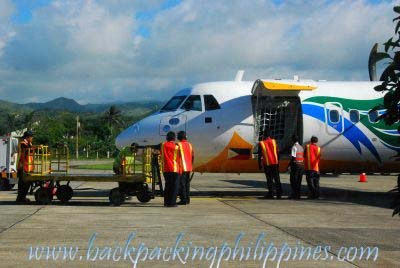 Stabilization also includes weighing of passengers with their carry-on baggage (this is similar to Tutubi's SeaAir flight to Busuanga in 2004). Passengers were requested to deplane by rows starting at the back rows, still, for plane stabilization purpose. 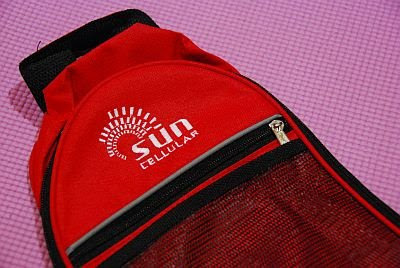 The best part of the flight, Tutubi's favorite, were the in-flight games where the cabin crew asked trivia questions from passengers and gave away nice shoe bags courtesy of Sun Cellular. It's unprecedented that Tutubi was able to win two shoe bags; one for each flight of his round-trip ticket! Cebu Pacific acquired several ATR72-500 aircraft manufactured by Avions de Transport Regional (ATR) based in Toulouse, France. Cebu Pacific Go Fares start at PhP688. 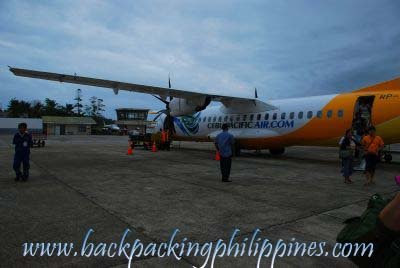 Flights to Kalibo start at PhP288. Terminal fee at Manila Domestic Airport is PhP200 white at Caticlan Airport is PhP10. Note: Flight Schedules may change without prior notice. Please check Cebu Pacific's official website. The fares ain't too bad. Great that you won on that flight! This is so great! Going to Boracay now becomes much more affordable and faster. People from VisMin now has more options. how much is the air fare for caticlan?